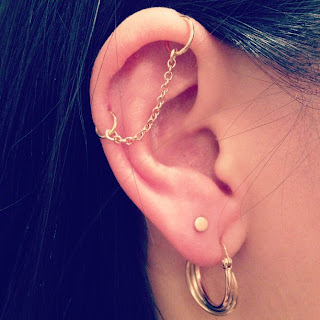 Gave new life to this old industrial piercing with two small rings and a delicate chain. This is lovely. Do you sell your industrial jewelry? I have been looking for a way to make my industrial a little more delicate, and while my shop in Oklahoma has some lovely lines for gauged ears, they haven't quite caught up in some of the other aspects of the game. It would be pretty cool, I would go for it. Its good way to become trendy and stylish. Is this attainable? This photo came to my attention a while ago and I have been searching for what seems to be ages for somewhere I can purchase one!